Finding a book like Tom Abrahams‘ SEDITION is one of the true joys of being an Indie writer. Actually, this book found me. Tom found me. I love this genre and was more than happy to give his book a chance. Tom couldn’t have been more accurate in his introductory email. This book is “right up my alley.” While Tom winds down from covering the 2012 election, take a look at my review and consider approaching politics from a different view. Did I mention that his book features a plot to kill several politicians? Maybe hundreds? After being subjected to thousands of TV and radio ads, sit back and enjoy some escapism fiction, SEDITION style. “Tom Abrahams delivers a tightly written, suspenseful thriller from start to finish. Drawing on the rich tapestry of U.S. politics, this timely conspiracy takes political maneuvering and secret cabals to a new level. Set in the hallowed halls of D.C.’s most ruthless powerbrokers, Abrahams draws on his rich experiences as a national political reporter to craft unforgettable scenes and shower the reader with “insider” details. 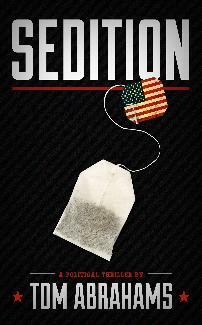 In a rising sea of political conspiracy novels, Abrahams’ SEDITION stands out as one of best I’ve read in several years. SEDITION is based loosely on a series of real historical events surrounding the Cato Street Conspiracy, in which a small group of radicals attempted to the British cabinet ministers and the Prime Minister in 1820. The new setting is modern-day Washington D.C., and Abrahams lends many of the historical names from the original conspiracy to the settings and characters in SEDITION. Taking a few moments online to research the original conspiracy adds another layer of enjoyment to the reading, but is in no way necessary to delve into Abrahams’ rollercoaster plot of twists and turns. Abrahams’ strengths as a writer rise to the surface in character development, scene description and faithful plotting. SEDITION brings to life one of my new favorite characters. Sir Spencer Thomas. Cunningly ruthless, fiercely intelligent and arrogant to a flaw, I couldn’t get enough of his “received pronunciation” and dry wit. He is a scathingly hilarious and psychotic character that you will love to hate. The rest of the Abrahams’ characters are crafted with equal attention. Particularly, he pays close attention to the link between their motives and the “conspiracy,” which is important for the genre and this story in particular. One does not engage in SEDITION of the highest order, without the strongest personal motivations, which he captures for each conspirator. The plot moves along swiftly and realistically. I detected no logic gaps or dreaded “leaps of faith.” The twists were well-timed and intensified the suspense, catching me by surprise a number of times, which is always rewarding. The final chapters were simply breathtaking. The sense of dread and urgency was palpable…I was reading as quickly as possible. The final aspect I will mention is the exquisite detail. Tom Abrahams can paint an immersive picture with his words. From the artwork that adorns the Capitol Building’s walls to the feel of fabric in a character’s suit, he draws the reader in with remarkable detail and sets them loose in the scene without wasting pages.